Throughout the late 17th century and until the present day Blackheath (and later other informal but protected open spaces around inner London: Hampstead, Barnes, Wimbledon Common, etc) have developed as the home bases for a middle class commuter population, tied to the City or Thames by reason of profession, industry, military service, etc. These people were the new literate upper and middle class, educated and with means, that wanted homes away from the City and industrial grime and stink, and at places where the air was clean, the soil drained and there was space for expansion for wives, family and servants. It was equally important to be at one�s desk or manufactory quickly and easily. These people were the first real commuters. Blackheath and west Greenwich could provide all the desirable elements in good measure. Communication was the key and it was easy. Water services at Greenwich were frequent and inexpensive, governed only by very high or low tides. There were numerous horse bus services from the south east into Southwark and across London Bridge. Putting aside small fragments of building which pre-date the major developments, the exploitation of Blackheath�s charms can be dated from the building of a number of mansions (initially three, but two more followed) in the 1690s on the west side of Greenwich Park, on a long strip of Crown waste on Blackheath. Only one mansion of the five survives in more or less original form � Rangers House, of 1699 - 1700, built with prize money by Captain (later Vice-Admiral Sir) Francis Hosier (1673 - 1727). 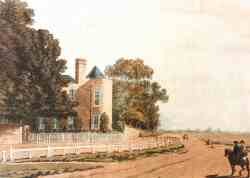 Another, demolished in 1815, was Montagu House, on the south west corner of Greenwich Park. As its name suggests it was occupied by the Montagu family. During the period 1799 to about 1811 it was the London home for HRH Princess Caroline of Brunswick, consort to George, Prince of Wales, later George IV (1762 - 1830). Whether the success of the late 17th century villa scheme encouraged others is hard to say but Blackheath�s next tentative step towards surburbanisation came in the late 1680s when George Legge, Baron Dartmouth (1648 - 1691) and his aunt, Susannah Graham (1617 - 1699) granted development leases for a number of plots on the far west side of the Heath, butting the highway of Blackheath Hill. Many of the Dartmouth Encroachments houses survive in part today (Nos 21 & 23, 22, 28, 30, 32, 34, 36 Dartmouth Row, and Dartmouth House) although alterations and redevelopment of the plots started as early as the mid 18th century. This encroachment still defines the west edge of Blackheath.